Australian artist Sue Ford's work marks the beginnings of feminist photographic art practice in Australia. Her interest in photography developed from an early age, documenting the everyday using her family’s Box Brownie. Ford’s first photographs were portraits of her school friends, dressed and made up in the latest fashions, often posing in self-conscious mimicry of the codes of glamour photography. After graduating as one of only two female photography students from the Royal Melbourne Institute of Technology in 1962, she set up a darkroom with her classmate, Annette Stevens, and ran a small commercial studio until 1967. She received a postgraduate diploma from the Victorian College of the Arts in 1974, the year her work was published in ‘New Photography Australia’. She also made films throughout the 1970s and 1980s, including ‘Faces’, ‘Time changes’ and ‘Egami’. Later she produced a series of colour laser prints dealing with representations of history, ‘Time surfaces’. The ‘Time Series’ grew out of such longstanding familiarity and friendship, beginning in 1964. The resulting portraits are presented usually as a diptychs, each separated by around a decade. Ford allows the camera to record the passage of time from youthful uncertainty to mature gravity and self awareness without intervention at a technical level. The photographs are taken without props or special lighting, and the subjects face the camera directly, without overt displays of expression or emotion. This lack of interest in technical finesse was in part a reaction against the emphasis on technical prowess and mastery of both camera and subject which dominated the 1960s. Ford’s approach presents an early feminist response to the emphasis on technique and to photography’s capacity for objectification. 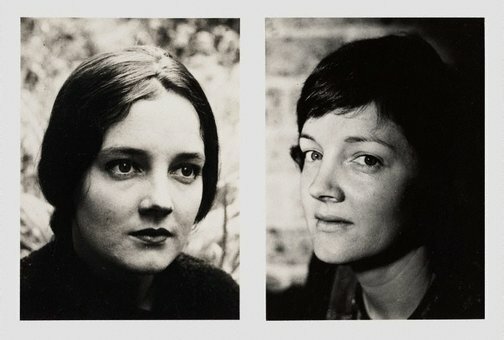 She consciously worked in a collaborative mode with her subjects and structured her images in such a way that it is the temporal dynamic between the photographs – the tension between what is presented, which is spare and economical, and what was lived ‘between time’ – which constitutes the significance of the work. Sue Ford , Melbourne, 2014, 76-77 (illus. ).